Deb Erickson Jackson has been a nurse and oral story teller, having the gift of gab, like her mom. Her stories are inspired with the help of her granddaughters, Jocelyn and Jaidon Turney. 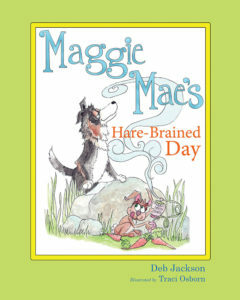 Maggie Mae’s Hare-Brained Day is Deb’s second published book. Pictured with Deb, are Holly and Maggie Mae, stars in the RedshoesDeb Series. 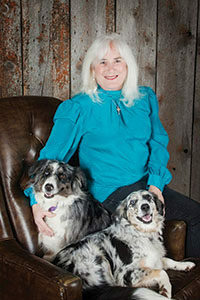 Deb’s stories feature Australian Shepherds and their ranch friends who share their exciting lives and the lessons they learn. Animals are used in an allegorical fashion to teach kids how to enjoy a value filled life.